I won’t hide that autumn is my favorite season in Paris: the weather is nice (much better than in spring! ), there are fewer tourists and more locals in Paris and colors are gorgeous. 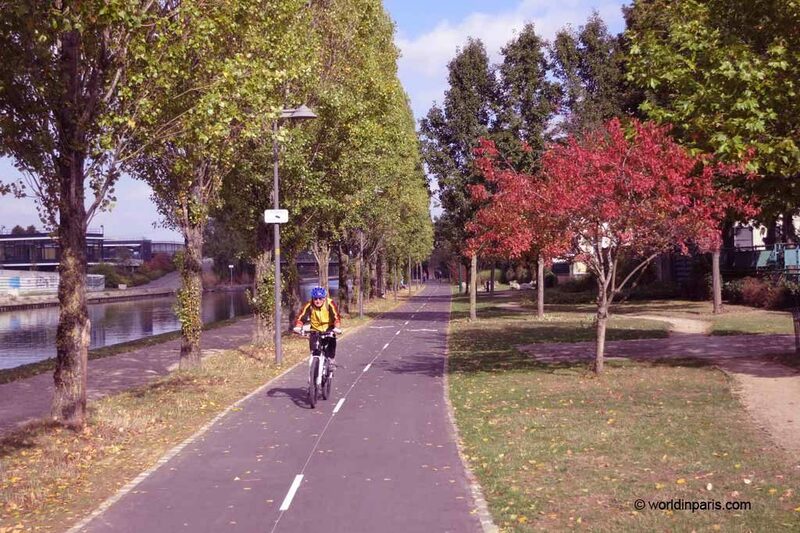 I chose a nice and warm Saturday of October to do one of Parisians’ favorite bike paths, the path along Canal de l’Ourcq. 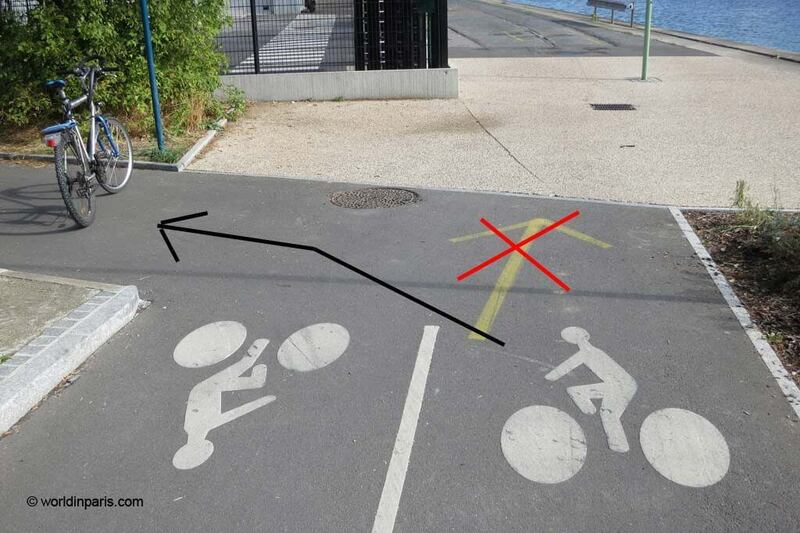 This is a 23 km path following the Ourcq channel, completely flat and totally separated from the car traffic so it is also a nice and safe activity to do with kids. If you don’t have your own bicycle don’t stop reading! There is a rental place at the beginning of the path, close to a metro station. For other rental options and many other biking tips in Paris check our Paris by bike guide. This ride is divided into four sectors, starting at Stalingrad Square in the 19th Arrondissement of Paris and ending up in Parc de Sevran (13km, one way). I wrote how to reach each sector so you can decide to start further or leave the path before, it depends on how much you want to ride. 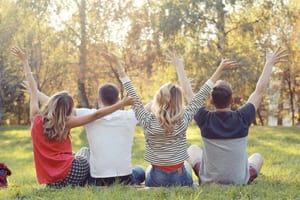 Watch the best day trips from Paris in 2019! Our starting point is Stalingrad square, at the foot of the metro’s viaduct. We are in front of the Bassin de la Villette and one of its locks. Since its construction in the XIXth century decided by Napoleon I, the Parisian channels are used as aqueducts (60% of non-drinking water in Paris) and also as mean of transportation. 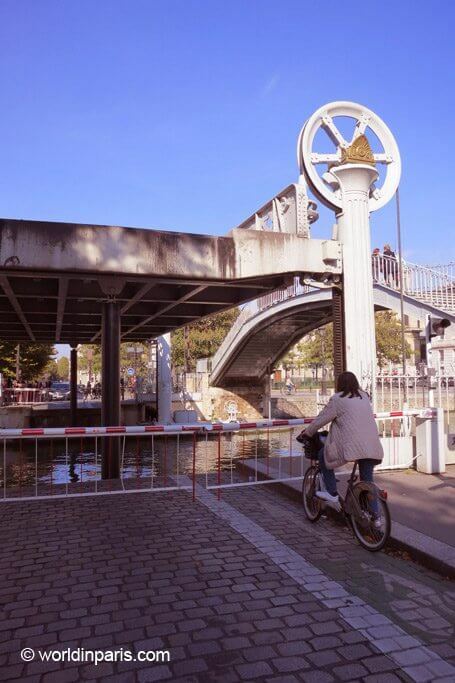 Thanks to the iconic péniches sailing the Parisian channels, the truck traffic inside the city is much reduced. 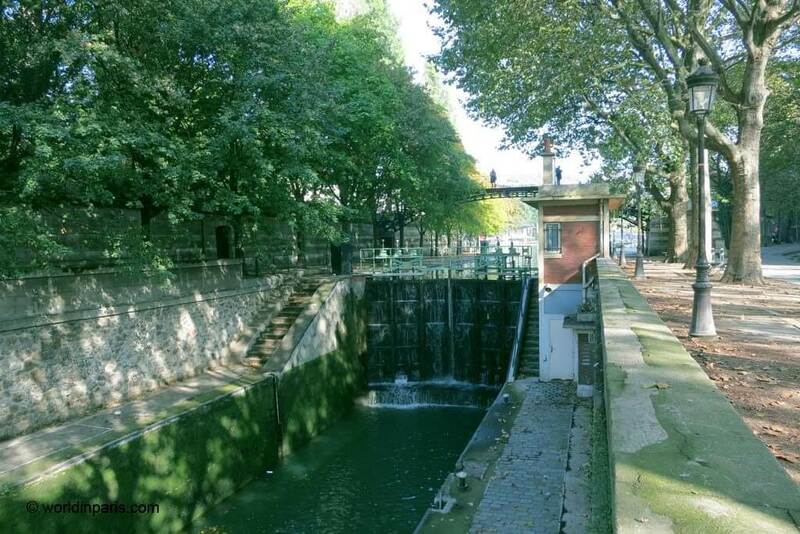 This lock allows the tourist ships and other vessels to go from Bassin de la Villette to Canal de Saint-Martin, which are at different levels. I cannot help waiting for the next ship going up or down through the dock, I always find it very impressive! We start riding North, along le Bassin de la Villette. 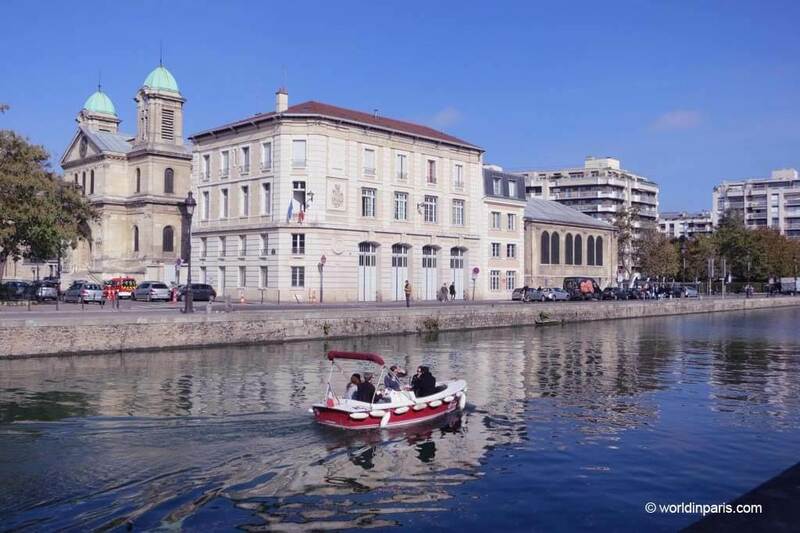 Built in 1808, le Bassin de la Villette is a nice 700m x 70m artificial lake where it is possible to practice different water sports. In summer it is also one of the Paris Plages locations but it is a cool place to go all year round for a nice walk or a cruise with Marin d’Eau Douce’s self-guided boats, this is super fun! At the end of Bassin de la Villette, a lift bridge separates le Bassin de la Villette from Canal de l’Ourq. If Vélib is not your thing, you will find your last opportunity to get a bike at AICV (38 bis Quai de la Marne 75019 Paris). Animation Insertion Culture & Vélo is the first bike-school in the Parisian region, a place where you can also rent and repair bikes. Now that we are leaving the city and there are fewer pedestrians on our way, we can ride faster! Right before entering Parc de la Villette, Canal Saint-Denis turns on the left. Built on the site of former abattoirs and designed by the architect Bernard Tschumi, Parc de la Villette is the largest urban cultural park in the capital. 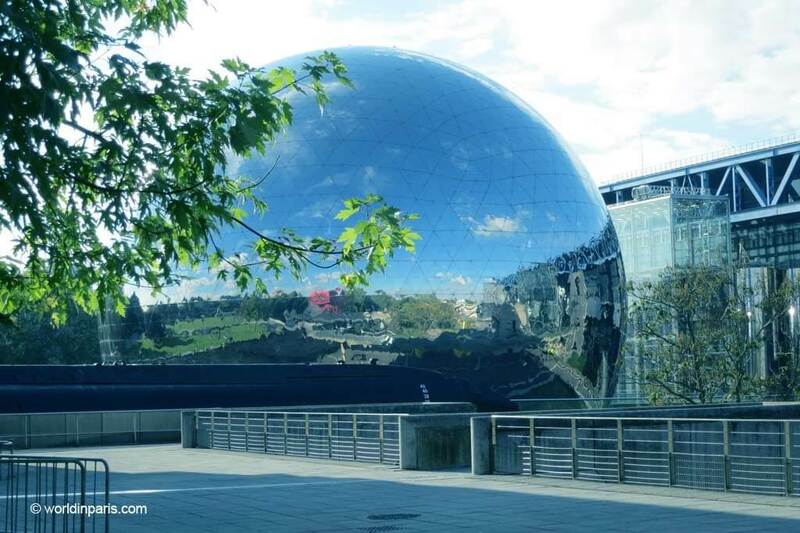 Apart from the green and kid-friendly spaces which can be enjoyed by foot, bike or boat there are also many cultural attractions, being the Cité des Sciences et de l’Industrie and its iconic Géode the most popular ones. The weather is sunny, with a super blue sky, so we will spend some time taking funny perspectives of la Géode on the way back. 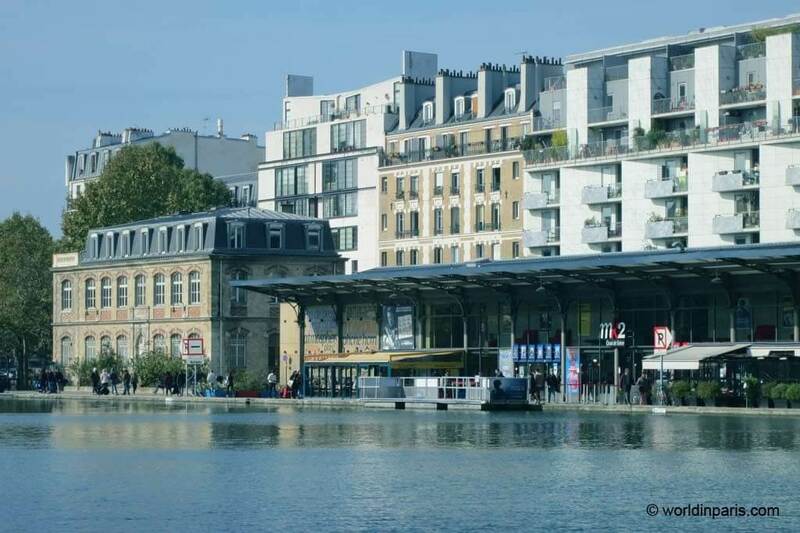 Once we cross Parc de la Villette, we finally leave Paris to enter the city of Pantin. Immediately on the left, we can see the huge mills of Pantin. Its location (along the Ourcq channel and close to the railway) was perfect for this kind of industry and in 1920 the company Grands Moulins de Pantin built this high building (8 levels) following the big flour-mills’ architectural standards of the XIX century. At the height of their activity, these mills produced 190,000 tons of flour a year, not bad!. Despite suffering big damages during the WW2 the mills worked until 2001. 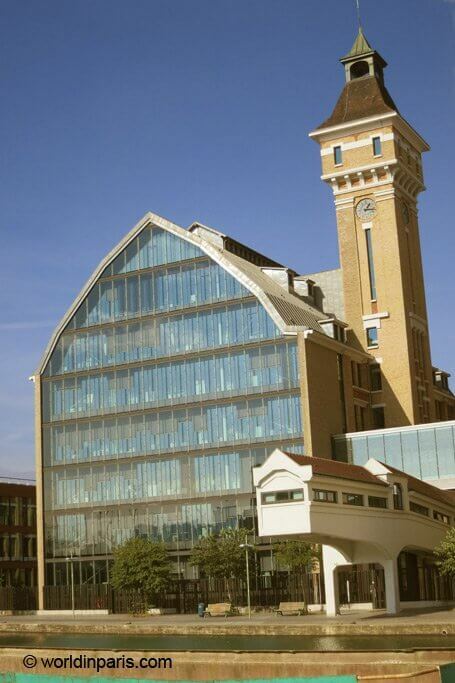 In 2006 the building was the object of a deep renovation and it hosts today some offices. After some pictures and some more minutes biking we find a temporary mark encouraging us to go straight ahead (48°53’42.6″N 2°24’46.3″E), don’t follow it! Because we want to avoid trucks and dust, we turn on the left instead to take the side path, and we join the main path again at the bridge (48°53’57.9″N 2°26’30.1″E). From here the path marks a steady but fascinating progression from urban to pastoral. Train yards and old, disused factories now splashed with fantastic street art leave the place to a sylvan landscape little changed from a century ago. It is time to slow down and enjoy the landscape. Along the way, there are fine picnic spots and a cafe or two for a pick-up coffee. We recommend bringing your own food from Paris because there are no shops around. 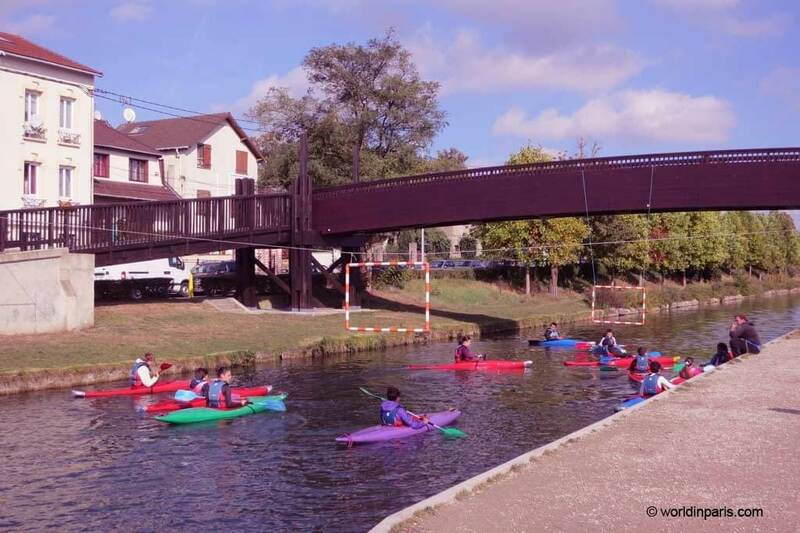 Just before entering Parc de Sevran there is a kayak school, where some kids are learning how to sail the channel. Just another way to enjoy Canal de l’Ourcq! Our ride ends at Parc de Sevran. The nearly 140 Ha of Parc Forestier de la Poudrerie (also called Parc Forestier de Sevran) are laced with solitary paths and dotted with 19th-century buildings connected with the gunpowder factory (poudrerie) once located there. Here we can bike in the forest but it was time for us to go back to Paris. Another option is to stay in the park longer and board a train for Paris with your bikes. You can take RER B, Sevran-Livry station or Vert Galant station. Hope that you enjoyed this ride with us. And if you ever come to Paris, have this little bike trip in mind! What a great way to experience the environs of Paris. It is such a family friendly activity too. I like how the bike rentals are close to the metro. There really is no excuse not to explore the canal by bike. Nevertheless, I loved your pictures, looks like you had a great time! What a lovely ride that you’ve had. Thoroughly enjoyed reading your experience. I wish there were more bike paths in the world. At least in the smaller towns and cities. I love autumn. But unfortunately I’m from Bombay, India and we have only 3 seasons here Summer, Monsoons & Not summer ;). Thankfully when I lived in Vietnam I had a chance to experience it. I can’t wait for my kids to get a bit bigger so we can go on biking trips! Less tiring than walking and better than the metro. What a great little route; looks absolutely perfect in the autumn. I can’t imagine a better way to see the sights than on a bike! Especially in the autumn, as that is my favorite season as well. Your photos are lovely and the description of the route so helpful! Pinning for future reference – thanks. I love that you are sharing how to bike around Paris. That is such a fun way to explore a town. And, fall is one of my favorite times of the year so it’s great to learn that that is a perfect time to see Paris. Hadn’t heard of this path before! Absolutely adore Paris, and after recently discovering just how handy it is to visit from London with the Eurostar, I think I will be giving this a try next time we visit. Thanks for sharing! Great post – I am visiting Paris again in May so will keep this in mind! I too would love to stroll around and bike around the area. I can see why autumn is your favorite. Perfect colours everywhere! Bike experience is a must, at least, by reading your article, I had known that there are bike rentals on the area as well. Such a beautiful biking trail. Absolutely love the green tall trees in the background. I would love to cycle here. This is the one thing that we don’t have here in the Philippines, bike paths. It would be lovely if we’d all just use bicycles instead of cars that’s been causing a traffic in the city. 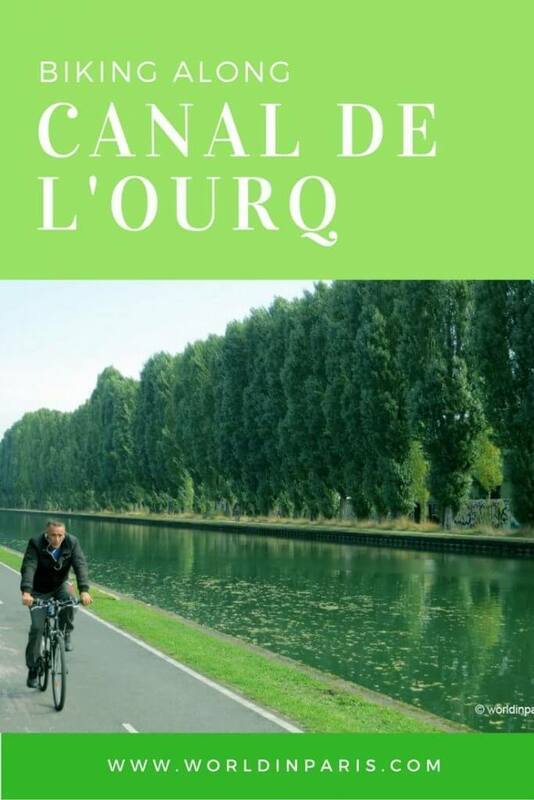 Anyway, I’d love to do a canal ourcq biking tour if ever I get there. I love that there is so much to see along the way. I totally love this guide. Oh thanks for your kind comment! 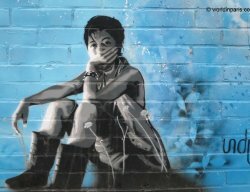 Do you think more bycicle life is possible in Ph in a near future? Autumn is definitely my favourite season, it just brings out the most wonderful colours and creates amazing sights. It sounds like you had the most amazing day! What an amazing bike ride you had. And for the bridge i would say the bigger version of this is built for the Three gorges dam, china. Bobigny is so amazing with the greenery.. I love doing biking trips. Thanks for sharing this nice article. 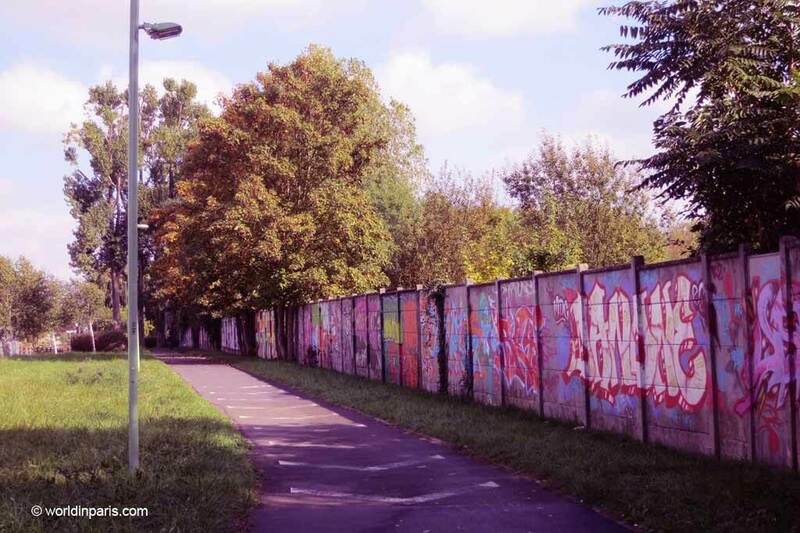 This bicycle path is full of surprises and awesome destinations along the way. They look really beautiful and the biking experience feels really relaxing. Surely you had a great time. What a great way to explore! I haven’t been on a bicycle in years, but will definitely consider it on my next trip to Paris. I visited there over a long weekend in May (a few years ago) and we had perfect weather – I can definitely see how it’d be lovely in autumn! Biking along the canals in Paris looks and sounds so enchanting. I would love to do this next time I am there. I need to get out into the country and explore the picturesque countryside of Paris. Looks just beautiful and a great way to see it all. Thanks for all the tips. These are the activities we liked to do when traveling. Nice photos too! What a picturesque bike ride! I would have never thought to explore Paris via bicycle. How far away from the city center does the path begin? I loved exploring Paris by bike – but I think I only got to the usual tourist haunts! Thanks for showing me all these other routes and pathways. It’ll be nice to explore the lesser-known side of Paris on my next visit! I loved following you along on your ride! 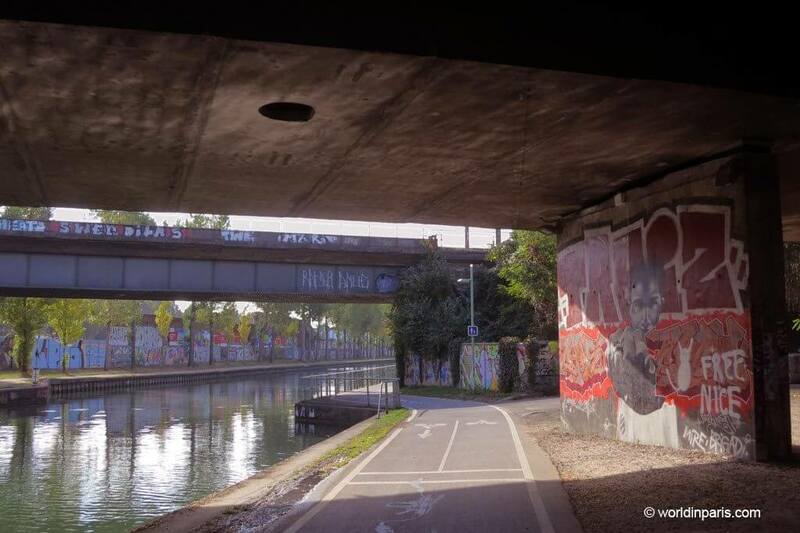 So fun to explore areas on bike often unseen – loved the discovery of graffiti under the tunnels leading to the canal. Thanks for sharing! Sarah, thanks to you for dropping by. And yes, the tunnel picture is my favourite, so much color under the dark tunnel! What a lovely guide! Your photos are amazing, makes me want to do this so much!